Standing watch over its harbor is the iconic symbol of Copenhagen – the Little Mermaid. Soon she will greet the international community coming to Copenhagen as her town hosts the COP15 climate summit early next month. She takes her role as host to the world seriously, but there are some that are coming to her home that make her angry. It is the thousands of lobbyist and Big Business representatives planning to come to the climate conference that have no interest in dealing with the problem and instead seek ways to hobble progress in order to pursue short-term profit over long-term sustainability. Because of those people, the Little Mermaid has become the Angry Mermaid. And to help expose those groups, businesses, and lobbyists who work tirelessly to block progress, she has established an award, the Angry Mermaid Award, asking anyone interested to vote for the company or organization that has done the most to sabotage effective action on climate change. 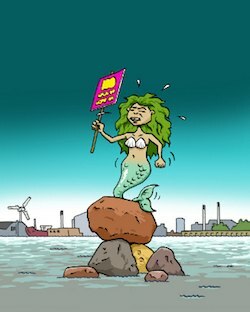 The Angry Mermaid Award was created through cooperation from five organizations, including Attack Denmark, Corporate Europe Observatory, Focus on the Global South, Friends of the Earth International, and Spinwatch. That is up to you! Help decide which of these lobby groups and companies have done the most to sabotage climate action by taking a few moments to vote. Voting is open until December 13 and the winner will be announced in the Little Mermaid’s home, Copenhagen, on December 15. Which one did I vote for? Here’s a hint. A lot of companies do indeed place a premium on profits at the cost of damage to the environment. It is unfortunate that whatever little progress we make towards making more stringent norms is also stalled by their intrusion fueled by short-sightedness. At Climatarians, our global sustainability directory, we highlight many of these issues.